Messerle and Sons is a family owned and operated business located in Coos Bay, Oregon. We are a fifth generation resource based, agriculture, forestry, and construction business. The business was started by Coos County pioneers as a single dairy. 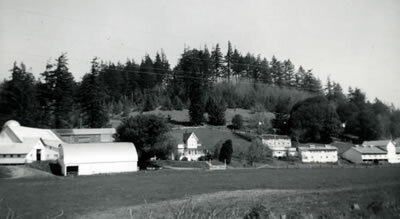 In the 1930s Everett Messerle along with his brother Lloyd and father Fred began acquiring dairies. Over the next part of the century the company began to grow and change. New family members became involved in the business to carry on the tradition and new ventures were started. The company now runs a forestry and ranching operation including forestry production, timber harvest, contract logging, beef cattle production and feeding, livestock marketing services, transportation, and construction. We take pride in being stewards of our land base and environment as this will continue the sustainability of our resource base. With being owner operators, we are in a unique position to serve our customers. We have many years of experience of maintaining ranch and forest land. So when we do contract jobs we follow the same standards as if we were working on our own land. We work hard to offer high quality service with honesty and integrity at affordable and competitive rates. Family owned & operated. A fifth generation resource based, agriculture, forestry, and construction business.